Send this striking superstar from the orchid world to someone special and watch their eyes sparkle and face light up (and prove once and for all that wishes really do come true). 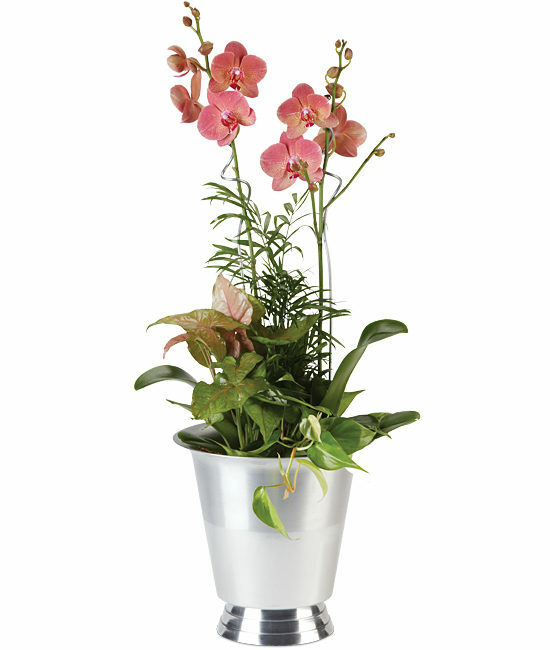 The double phalaenopsis garden stands tall above its lush foliage and shiny silver cachepot, its silky pink petals bursting with light and brightness. Add our handcrafted plant pin for stylish support. Place your garden where it will receive moderate light. This orchid does not like direct sunlight. It will do best with temperatures between 65 to 75 degrees. Keep plants evenly moist, the roots should never be dry. Water once or twice a week, but be sure that the roots are not soggy. Take garden out of basket or cachepot to water and drain. These plants like humidity between 40 -50%. Misting will help increase humidity. Fertilize once a month with a balanced orchid food at ½ strength.